These delicious Strawberry Champagne Chocolate Truffles are yours if you place an order* before the end of July 2018. 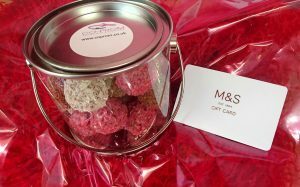 Re-useable clear bucket contains 20 x Handmade Champagne Truffles using the finest fresh natural ingredients. No added sugar, made with low-fat cream alternative make them a “not so guilty” pleasure, and a £10.00 M&S voucher towards a bottle of bubbly. Co Prom Ltd grows through referrals. If you know of anyone who would benefit from speaking to us, please pass on our details and if they place an order with us YOU will receive the reward too!